← Caption Contest 91 Winner! I'll probably do the Lab Coat and Shirt Tied Under the Bust next since I've already got Tops open. Hey. i recommend you creaing other creators of wich you can import those items into hero creator ect. but then again what do i know im just throwin it out there. Yes! The waistcoat is now up! I’m going to be a busy guy this week. Thanks Jeff! Shirt tied under the bust? Daisy Duke here we come! By the way, Waiste Coat . . . Fantastic! I was really looking foreward to this one. Thanks Jeff! These coats look great! Any way you would be able to use the patch pattern as an actual pattern? like in the pattern category. 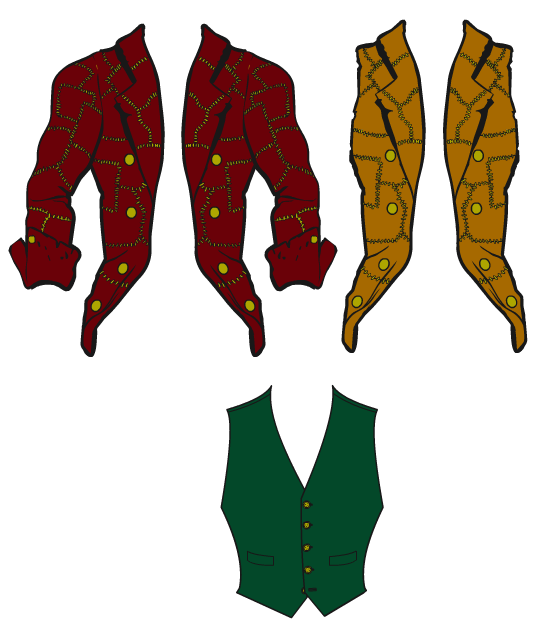 Waistcoat? Is that like a high fallutin’ word for vest? Doubtful, Mysterious Zed — the patterns take up a TON of room and slow the program to a crawl. I’m more or less done with those. Although down the road if someone wanted to add it into the Pattern-Standard set I could do that probably. Don’t know how much utility it would have. I’m delighted t’hear that shirt tied under bust is coming soon! Oops. sorry i dont think my first post was relevant to the area of my posting. straight jacket would be nice.. or full torso belts. Nice additions, Jeff! Any chance the cuffs on the patchwork sleeves could be a separate piece, maybe in the gloves section? Those would come in very handy! Also, and I apologize if this has been mentioned before, but have you noticed that the mens dress shoes are backwards? Oh, and very nice touch by leaving the bottom button of the waistcoat undone! Don’t know why it’s not supposed to be, but that’s what GQ says, so I’ma go with it! Mazel tov! Oh, finally a waistcoat! Now I can make western heroes and Regency/Victorian gentlemen!